Sold out in all proofs for many years! This painting belongs to the "Cobblestone Lane" Collection and is the second in Thomas Kinkade's popular Cobblestone Lane series. 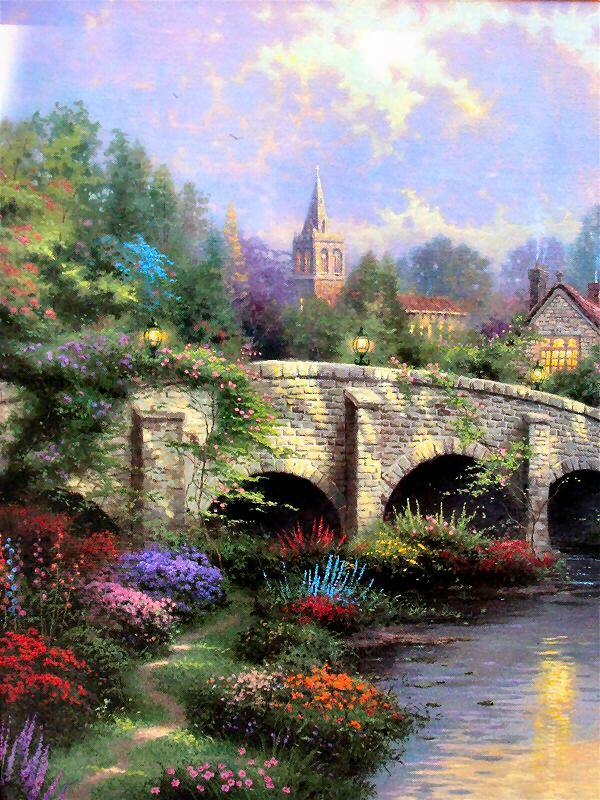 Visit my eBay Store for the Cobblestone Lane collection and other great Kinkade artworks! ++++ Tom created this painting in 1998 It has been SOLD OUT for years. It was made only in this one size. 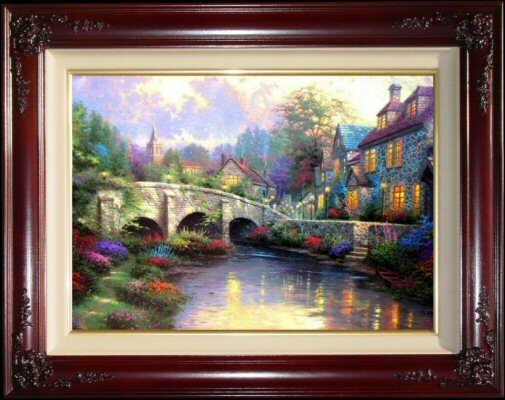 ++++ Brass Plaque with the legend "Cobblestone Brooke ~~ Thomas Kinkade"
++++ Theme: South West England village scene, cobblestone bridge. 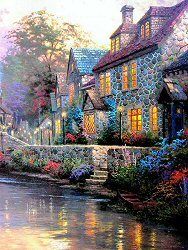 "With this, the second in my Cobblestone Lane Collection, I feel like I am getting to know the people who live in this quaint English village. I can begin to see the patterns in their lives, as they do good, honest work during the day, enjoy supper in the evening, or stroll to church on Sunday. Since Castle Combe is a real place, I get a deeper sense of the history here. Generations of families living here now and ancestors going all the way back to the original builders of the Medieval bridge. 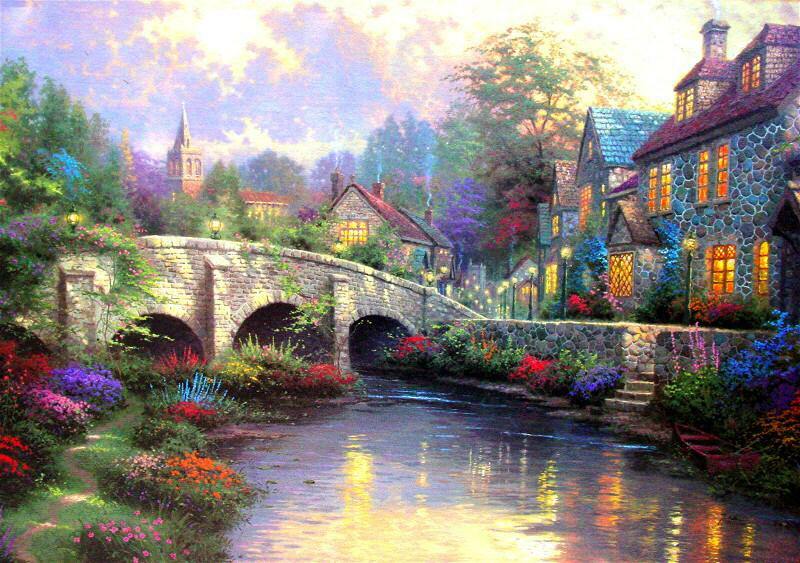 Just looking at this place where they live brings a peaceful smile to my heart. I wanted to make sure that my Cobblestone Lane Collection would take us into a perfect little English village, so I went to my sketchbook and brought out some memories. There it was - a mossy Medieval footbridge spanning a babbling brooke with ancient stone buildings hugging a cobbled lane. The village is Castle Combe in England's Wiltshire District. Nanette and I discovered it during our wanderings over the British countryside, and fell in love. We're by no means the only admirers of Castle Combe; it may be the most visited and photographed village in all of England. 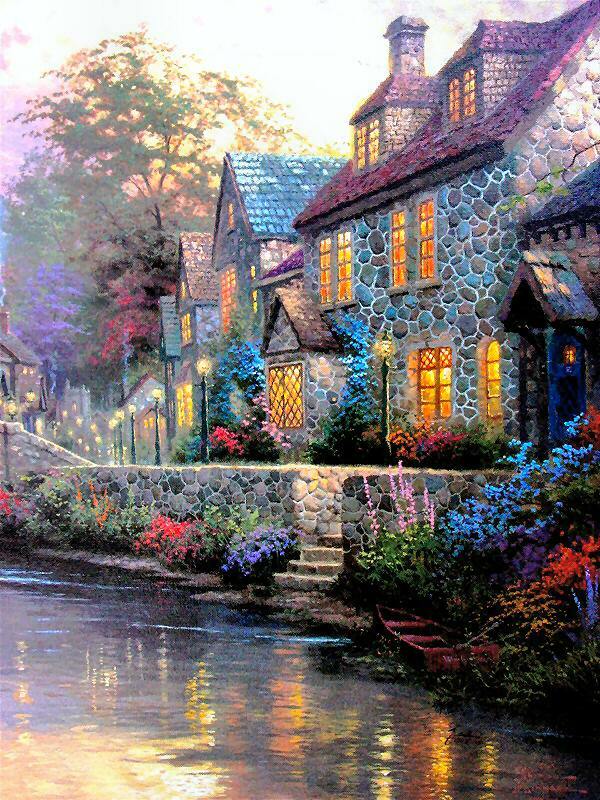 I've added some romantic touches: the varied textures of stone at dusk and the dance of reflected lights on the stream has, I pray, created a mood that is timeless beyond the mere physical features of the village. I suppose that's why I'm a painter, not a photographer. By the way, if my Cobblestone Brooke looks familiar, it may be that you've seen it in the movies - this quaint English village was the setting of the famous Dr. Doolittle movie of some years back. And what could be more English than Dr. Doolittle?"